Hematite is an important ore of iron and it's blood red color (in the powdered form) lends itself well in use as a pigment. Hematite gets its name from a Greek word meaning blood-like because of the color of its powder. Ancient superstition held that large deposits of hematite formed from battles that were fought and the subsequent blood that flowed into the ground. Crystals of Hematite are considered rare and are sought after by collectors as are fine Kidney Ore specimens. Hematite Iron Oxide Powder is the most important source of iron ore in the world. The production of iron has been important to nations of the world for over 2500 years. Today the addition of other minerals to iron has lead to the production of steel which is vital to the economy of the major countries on Earth. 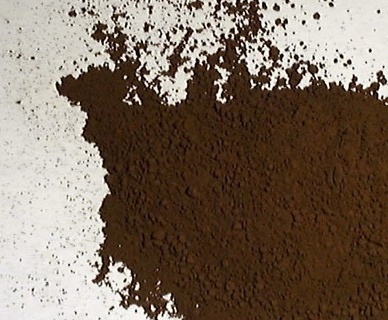 Hematite Iron Oxide Powder has a red or black color but the streak is always red. The iron in the hematite turns red when it comes in contact with water and oxygen. In other words this rock is rusted. Magnetic Absorption : 3 % max"